Nothing is made easier by stress. They wouldn't have called the childbirth process "labor" if it didn't require some hard work. Keeping calm and collected might seem easier said than done, but finding your happy place can actually promote a quicker and more comfortable labor experience. Comfort measures for different phases of childbirth are all natural ways for you to gain control of your body and get the affirmation you need to stay mentally and physically focused. These relaxation techniques can provide parents with drug free alternatives for labor discomforts and even keep partners feeling engaged and confident. The following relaxation techniques target your senses to give you some balance as you deliver your baby. Human beings are incredibly visual. Controlling the space around you can help you set the tone for the experience ahead. If the room you're delivering in is dim, warm and lit softly, you are more likely to create feelings of comfort, safety and tranquility through contractions. The view you have in your birthing space can also give you the motivation you need to keep feeling strong and focused on the task ahead. Bring photos and other comforts of home to customize your space. Sound is very powerful. In fact your baby has been comforted and stimulated by sound for the past 40 weeks. Whether you're choosing to include ambient noise in your birth suite like a waterfall, birds chirping or natural sounds or soft instrumental music can stimulate your body to produce comfort chemicals. When you find the music or soundtrack that helps you feel calm and at ease, play it regularly through your pregnancy to program your body to relax with every note. We all have that one scent that transports you into tranquil place. If you aren't birthing at home, bringing some textiles that smell like home can help the space feel more familiar. Using essential oils in your labor suite can encourage your body to calm, ease anxiety, and help you transcend from the stress of discomfort. Explore different scents as you prepare your hospital bag checklist and you may even want to have a series of different fragrances. Once in your suite, place a couple of drops on a cotton ball and hold to your nose. If the scent starts to bother you, just toss in a trash can outside of the room. While eating during labor is the topic of some debate in the birth world, keeping some sugar free candy on hand will keep your mouth hydrated through active labor. Some flavors and tastes can also trigger comforting hormones and may be associated with feeling better. For many, ginger is associated with feeling better and ginger drops can help ease any queasiness you might feel through your contractions. Touch is incredibly important for laboring mothers. When contractions intensify, muscles throughout the body become tense or strained. Gentle acupressure and massage can ease mothers through contractions. Reflexology, hydrotherapy and counter pressure can be extremely helpful for labor discomforts. Partners can also use these massage techniques to participate in comfort measures and keep the laboring mother focused. Engaging your senses can help you power through contractions and bring you closer to meeting your brand new baby. Get your body acquainted with these comfort measures to battle pesky pregnancy discomforts and wire your brain to feel relaxed when these senses are activated. After all, a comfortable birth is a happy birth. It's October and it should be bad luck to not have a freshly picked pumpkin on your front steps to celebrate the season to the fullest. Whether you're in search of that perfectly symmetrical pumpkin or something with a little more character, it's pumpkin picking season and we're getting our wagons ready for this year's pumpkin haul. Let's face it, you can't just pick one pumpkin. We've picked out our favorite paces to pick pumpkins in the Louisville area and we can hardly wait to get out to the farms to create some fall family memories. With an adorable name like Sunny Acres, you can expect a cute and family friendly farm where you can pick pumpkins and enjoy other fall activities with the kids. They have hayrides, a corn maze and even some sweet surprises. Sunny Acres is a popular destination for school field trips, equine and agricultural classes and more. With their beautiful farm views it's no wonder that Sunny Acres is a popular destination for weddings, events and more. For some serious pumpkin fun, Farm Life in Lanesville Indiana is an absolute must. This is the region's largest corn maze and pumpkin attraction, drawing huge crowds each year. They are so much more than just a few pumpkins in a patch and feature a long list of rides, slides, swings and jump areas than you can count on both hands. 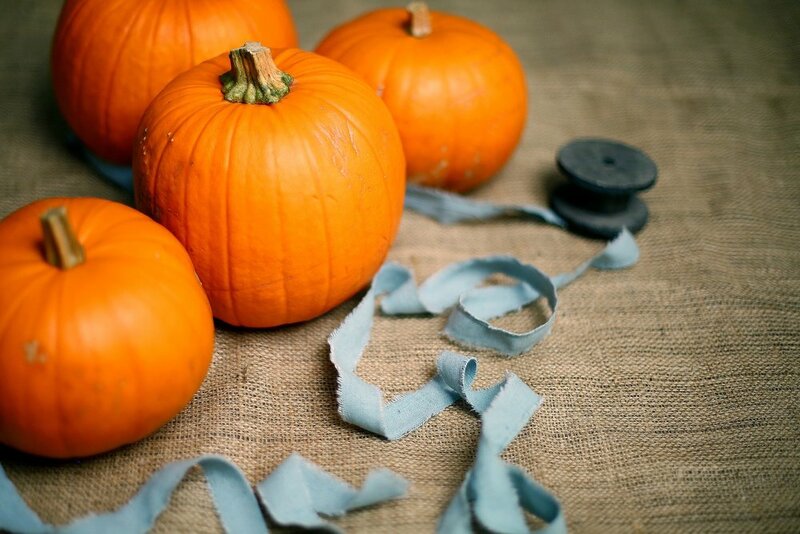 Come early in the day to enjoy a full day of pumpkin picking fun, some delicious lunch and gift shopping. This historic farm is a unique family owned and operated experience. The Bleemel's dedication to their family's farm and it's legacy is humbling and they offer a great pumpkin picking experience and farm visit. Take a hayride to see the farm's cows, wander through the hay maze or paint a masterpiece on your brand new pumpkin. A visit to Slow Poke farm is always a fun time. Gallrein Farms is a fun, family friendly day out with tons of activities to explore. Scoop up a wagon full of pumpkins and visit the farmer's market for some tasty treats. The kids can play on the barrel train, jump pillow, the obstacle course or the corn pit while parents can grab a bite to eat or satisfy their autumn sweet tooth at the bakery. We're ready for some fall farm fun. Whether you're enjoying a hayride or sampling your way through the home made sweets at the bake shop, a trip to a local farm during the fall is an experience to look forward to all year long. So put on some comfortable shoes, grab your best Halloween outfits and head over to some of Kentuckiana's celebrated farms for a great day of pumpkin picking. These past few weeks, mother nature is anything but happy. With a season of some incredible natural disasters devastating communities across the country, it's a solemn and humbling reminder that every family should be prepared for the worst. It's one thing to talk about the possibility of a flood, tornado or hurricane affecting your home or school and it's another to create a plan and prepare to keep your family safe when disaster strikes. Planning for these events doesn't have to be intimidating or even scary to discuss with your kids. It's easier than you think and makes a big difference in an emergency situation. The easiest way to tackle disaster planning is to categorize your efforts into three fundamental principles. Talk to your family as a team about natural disasters, how they differ, what can happen and where your safest route is for shelter. Discuss with your kids where to locate supplies, emergency contact information and what they need to do if they have to take charge on their own. Keep your home stocked and ready with the essentials you'll need for most power outages and scenarios that may prevent you from leaving the house. Keep supplies in two different areas of your home such as the basement and pantry upstairs to make sure they are always accessible. Get your family involved in checking supplies and expiration dates of non perishable foods and batteries. A natural disaster or emergency doesn't care if you are prepared or not. Practicing your escape route, calling out to your emergency contacts and gathering your escape bag with your kids can help them feel more prepared and secure should a real scenario take place. It can be as simple as gathering together as a family in an area of your home that is safe from windows or floods. You can never be too prepared for emergency situations. Over the past few weeks we've seen a devastating aftermath of multiple natural disasters that are prompting Americans to focus on preparing for emergencies. Getting involved in local associations and organizations for disaster relief can also empower your family to help others that need our help and to bring attention back to how we are preparing our homes for different emergencies and storms. Be safe. Be organized. Be prepared. Wait...I can't eat a snack while I'm in labor? Many hospitals and birth centers are still on the fence about eating during childbirth. Some medical professionals fear that eating can create some risks for the stressed and birthing mom, while others are adamant that it's the best way to keep your focus and energy up. You can be in labor for 2 hours or 15 hours. When our bodies are under stress during labor, breathing can be erratic while we try to relax. For many women, this makes eating tricky while they're in labor. If you breathe in small amounts of food or some liquid, it can enter the airways and cause dangerous infections and complications. This is especially a risk if you are needed to be placed under general anesthesia for a cesarean. Aspirating food can even develop into pneumonia in serious cases. The fear of aspirating during birth still keeps many hospitals and doctors in favor of a strict no-eating policy. While the concern about aspirating is a real one, more research is appearing in the realm of "delivery dining" and many more professionals are encouraging mothers to snack. Clear broths, jello, applesauce and other easy to eat and digest foods are still the recommended choice of doctors and nurses, however more birth centers are leaving it to the parents to choose what and when they eat during labor, as well as a myriad of other birth preferences. Doctors still aren't encouraging laboring women to eat large or heavy meals during labor, but small meals and snacks are becoming more recommended. For some, dietary needs are more important than just hunger. For diabetics, blood sugar is a constant need for balance and not eating for long periods of time can cause some serious medical concerns for mom and baby. Getting the right balance of food is also being recommended to help women get the sustainable energy they need to have a healthier and often shorter or more comfortable births. If you're expecting and interested in incorporating intermittent snacking into your birth plan, some of our local birthing centers are there to support you. Baptist Health Floyd in New Albany, Indiana and the University of Louisville Hospital in Kentucky are both letting parents choose light meals during labor. If you're curious about your hospital's limitations on food in the delivery space, just ask your birth team! While the risks for aspirating while in labor are small, they still exist. Talk to your doctor, midwife or hospital about your birth preferences and see if energy sustaining snacks are options for you. The choice to snack is up to you. It's your birth experience and you're empowered to make the decisions that will help you and your family be more comfortable and confident when the big day finally arrives! On those hot summer days we'll bet the last thing you want to do is spend time cooking a big family dinner. We're all for convenient and easy meals that can appeal to even the pickiest eaters at our dinner table. To help parents make a menu that won't break a sweat, we put together some of our summer favorites that are simple and semi-homemade. You might even have some tasty leftovers to pack in your poolside picnic the next day! Heat 1 teaspoon oil in a large skillet over medium-high. Add spinach; cook 3 minutes or until completely wilted, stirring frequently. Remove from heat. Place pizza crust on a sheet of parchment paper; spread marinara sauce evenly over crust. 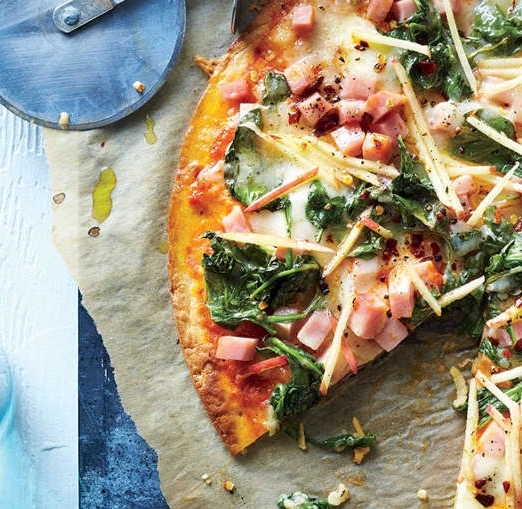 Arrange spinach, ham, cheddar, and mozzarella evenly over sauce. Place pizza on parchment directly on oven rack; bake at 500°F for 9 minutes or until cheese melts and begins to brown. Remove from oven. Top with apple and peppers; drizzle with remaining 2 teaspoons oil. Cut into 8 wedges. Cook pasta according to package directions, omitting salt and fat. Add broccoli during the last minute of cooking; cook for 1 minute. Drain. Combine milk and next 5 ingredients (through salt) in a medium bowl, stirring with a whisk until smooth. Heat a large skillet over medium-high heat. Add bacon; cook 4 minutes or until crisp. Add butter to pan; swirl until butter melts. Add milk mixture to pan; bring to a boil. Cook 1 minute, stirring frequently. Stir in cheese. Add pasta mixture to pan, stirring to coat. Place 4 tablespoons cornmeal in a shallow dish. Combine milk, 2 teaspoons mustard, and egg in a separate shallow dish, stirring with a whisk. Combine pretzels, remaining 1 tablespoon cornmeal, 1/4 teaspoon garlic powder, sugar, 1/8 teaspoon salt, and pepper in a third shallow dish, stirring with a whisk. Lightly dredge chicken in cornmeal, dip in milk mixture, and dredge in pretzel mixture, pressing gently to coat thoroughly. Lightly coat chicken with cooking spray. Heat a large ovenproof skillet over medium-high heat. Add oil to pan; swirl to coat. Add chicken; cook 3 minutes or until browned. Turn chicken over, and place pan in oven. Bake at 375° for 7 minutes or until done. While chicken cooks, combine mayonnaise, yogurt, chives, lemon juice, remaining 1 teaspoon mustard, remaining 1/2 teaspoon garlic powder, and remaining 1/8 teaspoon salt in a medium bowl, stirring with a whisk. Serve sauce with tenders. Place carrot and potato on paper towels; squeeze until barely moist. Weigh or lightly spoon flour into a dry measuring cup; level with a knife. Combine flour, onion, garlic powder, 1/4 teaspoon salt, pepper, and eggs in a large bowl. Add potato mixture; stir to combine. Heat a large nonstick skillet over medium heat. Add 2 teaspoons oil; swirl to coat. Heap 3 tablespoons potato mixture into pan to form a patty; flatten slightly. Repeat procedure 5 times to form 6 patties. Reduce heat to medium-low; cook 6 minutes on each side or until golden brown. Place pancakes on a baking sheet; keep warm in oven. Repeat procedure twice with remaining oil and potato mixture to yield 18 pancakes. Sprinkle with 1/4 teaspoon salt. Combine remaining 1/4 teaspoon salt, yogurt, curry, and honey in a bowl. Serve curry sauce with pancakes.